On his way: Having caught a toss from quarterback Joe Viviano, Adam Scott heads goalward for the touchdown that gave Harvard a 28-14 lead. Flying to the ball: Harvard special teamers Mikah Hughes (34) and Cecil Williams (80) halt Columbia kick returner Lynnard Rose. Fair or foul? 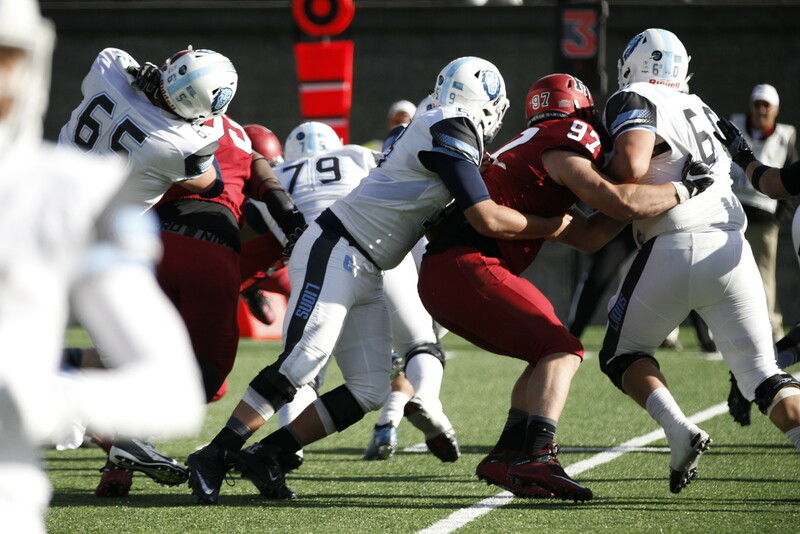 Columbia resorted to using two blockers (and any means necessary) to try to keep Harvard defensive lineman James Duberg out of its backfield. Quite a reach: Harvard's Anthony Firkser stooped to snag a pass from quarterback Joe Viviano. The play gained 36 yards. It was the week the Cubs won the World Series. So why not add to the weirdness by having Columbia beat Harvard? For one half at Harvard Stadium this past Saturday, such a bizarre outcome seemed more than possible. Sacking Crimson quarterback Joe Viviano ’17 five times and turning a blocked punt into a touchdown, the longtime Ivy doormat Lions had the Crimson at bay. Then came a brief but decisive reversion to form and Harvard took advantage of traditionally bumbling Columbia play to pile up enough points for an eventual 28-21 victory. The win during Freshman Family Weekend brought Harvard to 7-1 overall and 5-0 in Ivy League play. Thanks to Princeton’s thrashing of Penn, the Crimson is now alone in first place in the Ivy standings as it heads for a Friday-night showdown in Philadelphia. (See “Coming Up,” below.) The victory also nudges Harvard coach Tim Murphy into second place among Ivy coaches over Columbia’s Al Bagnoli (who achieved almost all of his triumphs at Penn). Murphy now has 115 league wins, trailing only the 135 of Yale’s Carmen Cozza. Two years ago Harvard beat Columbia at the Stadium 69-0. Ever since, Bagnoli has worked to close the gap. He has forged a rugged defense, highlighted on this day by linebacker Gianmarco Rea (15 tackles and two sacks, both game highs). But the Crimson’s talent edge at the offensive skill positions remains glaring. (Especially when you see the Lions receivers repeatedly dropping eminently catchable passes.) 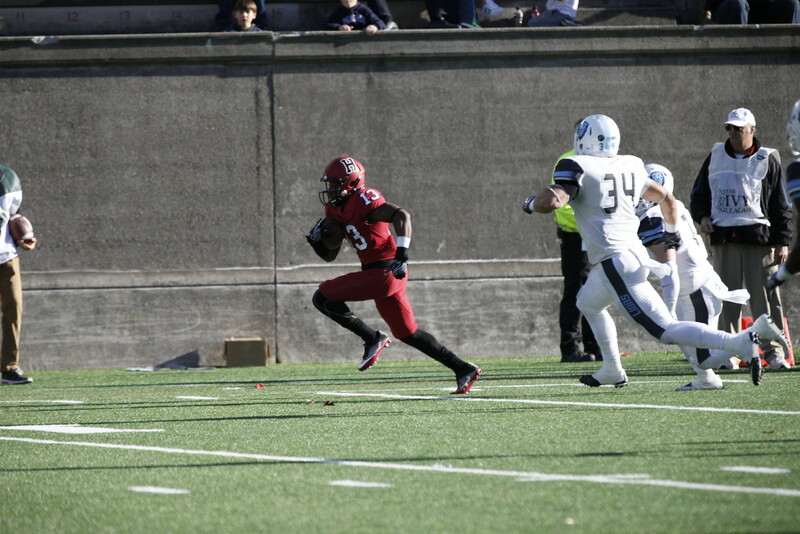 Most vivid are the Harvard receivers: wideouts Adam Scott ’19 (seven catches, 109 yards, two touchdowns) and Justice Shelton-Mosley ’19 (five catches, 63 yards), and tight end/H-back Anthony Firkser ’17 (four catches, 79 yards, one touchdown). On the ensuing series, the Harvard defense—stifling much of the day—forced a Lions punt. Looking into the glinting sun, returner Alex LaPolice ’19 called for a fair catch but muffed it. (Particularly in fair-catching too close to the goal line, LaPolice often makes an adventure out of punt receiving.) 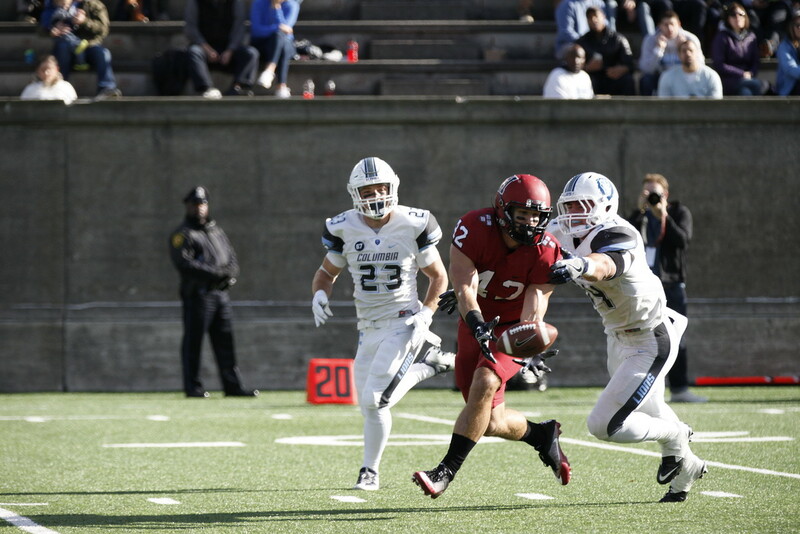 Columbia’s Ryan Gilbert recovered at the Harvard 42. A penalty brought the ball back to the Lions’ 43. From there quarterback Anders Hill engineered a deft six-play scoring drive that culminated in a six-yard toss to wide receiver Ronald Smith II. Oren Milstein, Columbia’s freshman-sensation kicker, booted the extra point. Harvard 7, Columbia 7. Attempting to reestablish normalcy, the Crimson went on an 85-yard drive to no avail, despite a spectacular 36-yard gain by a streaking Firkser on a ball he plucked just before it would have hit the turf. Harvard had a first-and-goal at the Lions three and did not get the ball into the end zone. The final play was particularly frustrating: from the one-yard-line (and after a Crimson timeout, no less), Viviano—who usually works from the shotgun—suddenly moved right behind the center to take the snap, which he bobbled. Sheesh! As the second half began, coach Murphy tried to rally his troops by pointing to the Penn-Princeton score; the Tigers led, and their victory would assist the Crimson. “I told ’em, we need some juice,” the coach said he instructed his charges. The Lions promptly cooperated by fumbling the second-half kickoff. But the Crimson gave the ball right back, when Brock Kenyon intercepted Viviano. The Lions tried to get out from the shadow of their goal, but on third-and-two from the Columbia nine, Hill was hit by defensive lineman DJ Bailey ’19 and fumbled. 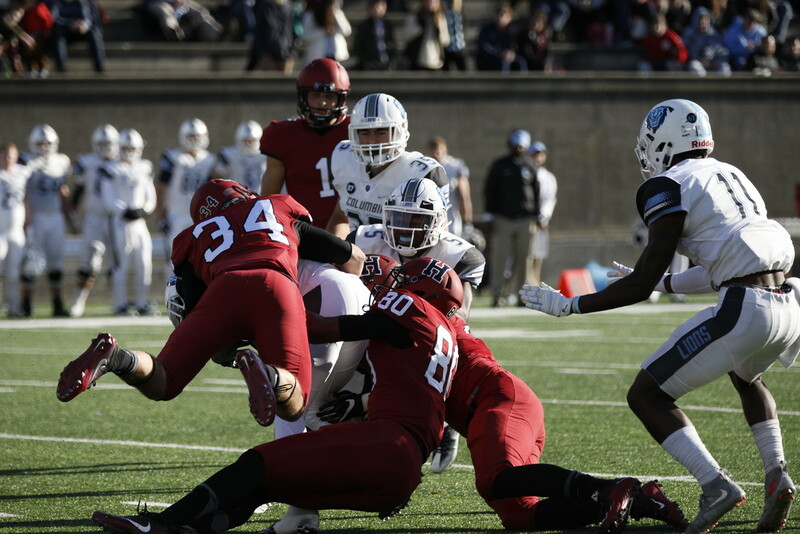 (Fumble-interception-fumble: Ivy League football at its finest!) Defensive lineman Scott Garrison ’19 recovered. After a penalty that moved the ball back to the Columbia 27, it took only two plays for the Crimson to score. On the second, running back Charlie Booker ’19 ran through a big hole provided by left tackle Max Rich ’17 and cantered 15 yards into the end zone. McIntyre converted. Harvard 14, Columbia 14. After the Lions went three-and-out, Harvard got the ball at midfield. On third and 10, Scott (covered one-on-one) made a twisting catch and took the ball down to the Columbia six. (A play almost impossible to defend.) On second and goal, Firkser slipped out to the right and caught an eight-yard toss from Viviano for a touchdown. McIntyre swung his leg. Harvard 21, Columbia 14. At this point Bagnoli pulled Hill and inserted Skyler Mornhinweg at quarterback. “I was looking for a spark,” the coach said. Mornhinweg provided one, completing 12 of 24 passes. In the fourth quarter he directed the Lions on an 84-yard drive capped by a four-yard toss to Josh Wainwright that (with the Milstein kick) brought Columbia within seven. They got no closer, despite Harvard’s inability to run out the clock, partly due to the head-scratching strategy of throwing a lot of clock-stopping incomplete passes. The outcome was not determined until the last play from scrimmage, when Crimson defensive back Tanner Lee ’18 intercepted a Lions Hail Mary heave at the Harvard eight. This was the Crimson’s third straight Ivy close call. Despite all the agita, Harvard almost astonishingly finds itself alone at the top with two games remaining. In fact, a victory on Friday against Penn would clinch no worse than a share of the Ivy title for a rather workmanlike group that won’t scare you. It will, however, beat you. COMING UP: On Friday night, Harvard will be in Philadelphia to take on Penn. Kickoff: 8 p.m. The game will be telecast on the NBC Sports Network, and broadcast on radio WXKS 1200 and 94.5 FM-HD.2, and on WHRB-FM 95.3. The Quakers are 5-3 overall and 4-1 in Ivy League play. Harvard leads the series 48-36-2 but Penn won last year in Cambridge 35-25, snapping a 22-game Crimson winning streak. The Quakers have two of the league’s best offensive threats in quarterback Alek Torgersen and wide receiver Justin Watson, both of whom riddled the Harvard defense in 2015.